Blue Ridge Wheat could be described as an Americanized Bavarian Hefeweizen. 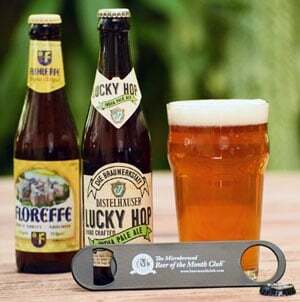 It possesses all the characteristics of a true classic Hefe, yet they are not as pronounced. We’d consider it an excellent introduction to the style as for many, it’s an acquired taste. Blue Ridge Wheat is brewed with a combination of two-row pale, wheat, and carapils malts and is hopped exclusively with Mt. Hood hops twice during the boil. Look for a hint of banana and clove in the nose, a resultant of using a Bavarian Hefeweizen yeast strain. You can also pick up the malted wheat in the nose. This straw-colored, non-filtered, medium-bodied wheat ale starts dry, yeasty and wheaty and moves into a floral fruitiness. Note a clean, non-lingering finish. Overall, a very refreshing, clean and tasty introduction to a classic style. As summer comes to a close, we’re in heavy denial here at Microbrewed Beer of the Month Club and fully intend to gather around Barbecue well into November and December. Hell, we live in American Baby ... Where mass consumption of Beer, Burgers and Chili is the order of the day at any Red-blooded BBQ! On that note, here’s a list of food. When you mix it all up and cook it, it tastes real good. Be sure and save a beer or two from your shipment to cool your engine. 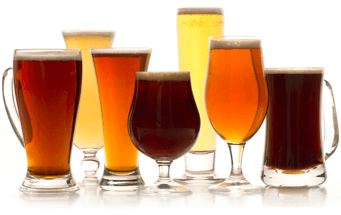 THE ALE STREET NEWS - Can a brewski a day help your kidney stones at bay? A study of nearly 30,000 male smokers says it’s true. A recent research project in Finland indicated that drinking a brew per day reduced the risk of the formation of kidney stones in men. How much? A whopping 40 percent! The researchers tested other beverages in the trial. But beer alone significantly reduced the incidence of kidney stones. The July 15 issue of the American Journal of Epidemiology reports that the healthful effects could be the result of the water and alcoholic content of beer. (italics) I’m thinkin’ TWO beers a day and I never have to worry about kidney stones again! I recently traveled China and although I never made it to the dried insect market that Commander McBrew described in your last newsletter, I was able to try a few Chinese brews and was wondering what you think of Chinese beer. Before I answer your question, I was wondering if you might be able to tell me, my fine human friend, exactly what the difference between Beer Nuts and Deer Nuts is? "Don’t know", you say. "Not a clue", you say. Well, Beer Nuts are $1.75 and Deer Nuts are under a Buck. Get it? Deer … Nuts …Buck … Sorry. I’ve been trying to tie that one in with a question for months and recently concluded, "Hey homedog, who’s damn column is this anyway?" Beers produced in China are well-crafted, German-style lagers. Though not tremendously interesting and generally unpronounceable, they will complement a plate of Mu Shu Pork or Kung Pao Chicken nicely. If, however, you happen to be a canine and are trying to culturally blend, attempting the use of chop sticks with paws, I recommend something a little more potent, like a good Barely Wine or Imperial Stout. Chow-mein baby!